Adult Robitussin® Peak Cold Cough + Chest Congestion DM Non-Drowsy. Dextromethorphan HBr (cough suppressant) guaifenesin (expectorant). Relieves: Cough. Mucus. DM. For ages 12 & over. 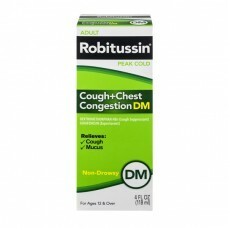 For most recent product information, visit www.robitussin.com. Uses: Temporarily relieves cough due to minor throat and bronchial irritation as may occur with a cold. Helps loosen phlegm (mucus) and thin bronchial secretions to drain bronchial tubes. Robitussin® liquid formula provides soothing action and targets the source of your cough - plus relieves your chest congestion. Should be 18 or older to purchase. Parents: Learn about teen medicine abuse. www.stopmedicineabuse.org. Questions or comments? Call weekdays from 9AM to 5PM EST at 1-800-762-4675. Use dosage cup included. ©2012 Pfizer Inc.
Do not take more than 6 doses in any 24-hour period. Measure only with dosing cup provided. Keep dosing cup with product. ml = milliliter. This adult product is not intended for use in children under 12 years of age. Adults and children 12 years and over. Dose - 10ml every 4 hours. Children under 12 years - do not use. Other information: Each 10 ml contains: sodium 7mg. Store at 20-25 degrees C (68-77 degrees F). Do not refrigerate.